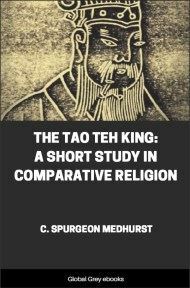 This translation of Laotzu's Tao and Wu Wei by Dwight Goddard, who was a Zen Buddhist, is very readable and comes very close to the essence of the text of the Tao te Ching. 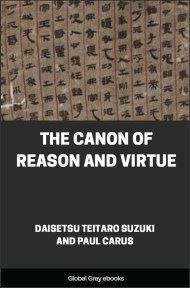 The book also includes a translation of an extended essay by Henri Borel on Taoist philosophy and aesthetics. When every one recognizes beauty to be only a masquerade, then it is simply ugliness. In the same way goodness, if it is not sincere, is not goodness. So existence and non-existence are incompatible. The difficult and easy are mutually opposites. Just as the long and the short, the high and the low, the loud and soft, the before and the behind, are all opposites and each reveals the other. Therefore the wise man is not conspicuous in his affairs or given to much talking. Though troubles arise he is not irritated. He produces but does not own; he acts but claims no merit; he builds but does not dwell therein; and because he does not dwell therein he never departs. Neglecting to praise the worthy deters people from emulating them; just as not prizing rare treasures deters a man from becoming a thief; or ignoring the things which awaken desire keeps the heart at rest. The Tao appears to be emptiness but it is never exhausted. Oh, it is profound! It appears to have preceded everything. It dulls its own sharpness, unravels its own fetters, softens its own brightness, identifies itself with its own dust. Heaven and earth are not like humans, they are impartial. They regard all things as insignificant, as though they were playthings made of straw. The wise man is also impartial. To him all men are alike and unimportant. The space between heaven and earth is like a bellows, it is empty but does not collapse; it moves and more and more issues. A gossip is soon empty, it is doubtful if he can be impartial. The Spirit of the perennial spring is said to be immortal, she is called the Mysterious One. The Mysterious One is typical of the source of heaven and earth. It is continually and endlessly issuing and without effort. Heaven is eternal, earth is lasting. The reason why heaven and earth are eternal and lasting is because they do not live for themselves; that is the reason they will ever endure. Therefore the wise man will keep his personality out of sight and because of so doing he will become notable. He subordinates his personality and therefore it is preserved. Is it not because he is disinterested, that his own interests are conserved? True goodness is like water, in that it benefits everything and harms nothing. Like water it ever seeks the lowest place, the place that all others avoid. It is closely kin to the Tao. Inasmuch as it is always peaceable it is never rebuked. Who can protect a public hall crowded with gold and jewels? The pride of wealth and position brings about their own misfortune. To win true merit, to preserve just fame, the personality must be retiring. This is the heavenly Tao. By patience the animal spirits can be disciplined. By self-control one can unify the character. By close attention to the will, compelling gentleness, one can become like a little child. By purifying the subconscious desires one may be without fault. In ruling his country, if the wise magistrate loves his people, he can avoid compulsion. In measuring out rewards, the wise magistrate will act like a mother bird. While sharply penetrating into every corner, he may appear to be unsuspecting. While quickening and feeding his people, he will be producing but without pride of ownership. He will benefit but without claim of reward. He will persuade, but not compel by force. This is teh, the profoundest virtue.